***For Editors: Links to B-Roll footage for broadcast are available below. Each day, about 10 people are killed in distracted driving crashes - contributing to the 37,000 people killed in crashes on U.S. roadways during 2016, according to the National Highway Traffic Safety Administration (NHTSA). 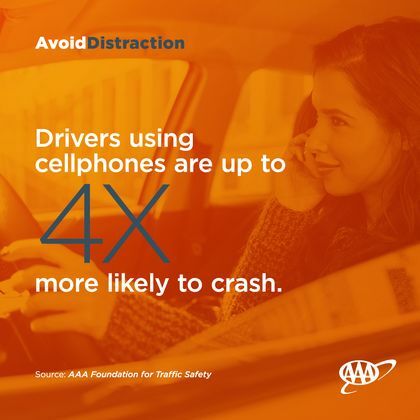 As National Distracted Driving Awareness Month begins, AAA East Central is launching a new, multi-year initiative that aims to reduce deaths and injuries as a result of cell phone use by drivers. “Don’t Drive Intoxicated – Don’t Drive Intexticated” is the theme of AAA’s traffic safety education campaign created to make distracted driving socially unacceptable. The campaign targets drivers who would never consider drinking a beer behind the wheel, and yet, regularly engage with mobile devices that dangerously take their eyes, hands and minds off the road. AAA East Central recognizes the impact that more than 50 years of public education efforts against alcohol-impaired driving have had across the country. Those campaigns helped to achieve changes to alcohol-impaired driving laws, increased enforcement, and, critically, a shift in public attitudes and behaviors toward drinking and driving. Although much more still needs to be done, anti-drunk driving campaigns and related efforts have helped cut the number of alcohol-impaired crash fatalities in half since the 1980s, according to the National Institutes of Health. For more information visit AAA.com/DontDriveDistracted.